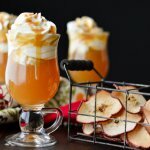 The mingling of flavors in this cocktail makes it a perfect Autumn drink. I’ve chosen apple brandy, apple cider, and a bit of caramel flavoring syrup. It is that simple. Top it off with homemade sweetened whipped cream and a drizzle of caramel sauce. In a small saucepan, heat the apple cider over medium heat until hot. Remove the pan from the heat and add apple Brandy and caramel flavoring syrup. Divide into 4 – 8 oz mugs, top with whipped cream and drizzle with caramel sauce.